The Kata Sensitivity V Backpack is part of the Kata Ergo-Tech series of bags. 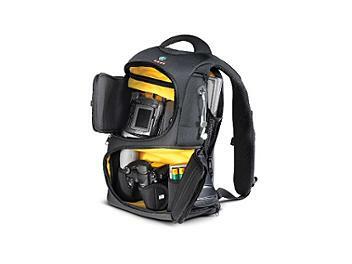 It is designed to protect and carry a digital camera, MP3/MP4 player, PDA, cell phone and laptop computer with accessories. The bag is made from Elasto-Guard a material that is flexible and will adjust to the ever-changing shapes and movements of the user's body, while it is also able to shift shape in order to fit the variable equipment within. The bag is carried by a carry handle or ergonomic backpack straps. It has designated safe guard zones that feature internal modular padded divisions and external Flexi-Shield reinforcement for greater protection of the equipment. Lower section has Elasto-Guard sleeves to secure and protect delicate equipment (if not in use these just fold away to allow for other gear) and Flexi-Shield reinforcement runs along the sides. One low profile high capacity side pockets will hold water bottles etc.